This is the regular green-band trailer for Danny Boyle's "Trance" starring James Mcavoy, Rosario Dawson and Vincent Cassel. Although it's lighter on violence, it provides a new look for the film and it's overall a much flashier and cool-looking trailer. "Trance" hits theaters on April 5 in the US and March 27 in the UK. 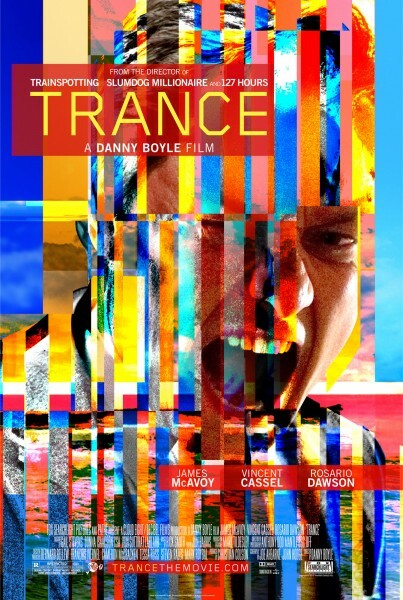 "TRANCE, directed by Oscar®-winning filmmaker Danny Boyle (Slumdog Millionaire, 127 Hours) and co-written by Oscar®-nominated long term collaborator John Hodge (Shallow Grave, Trainspotting) is a seductive and enigmatic thriller starring James McAvoy, Vincent Cassel and Rosario Dawson. Unable to coerce the painting’s location from Simon, Franck and his associates reluctantly join forces with a charismatic hypnotherapist (Dawson) in a bid to get him to talk. But as they journey deeper into Simon’s jumbled psyche the boundaries between reality and hypnotic suggestion begin to blur and the stakes rise faster and far more dangerously than any of the players could have anticipated."